I got another solicitation email from yet another generic and understandably unmemorable company trying to sell CRM services. Is CRM a service? This is remarkable only because they keep sending the same messages, always referencing CRM like I know what it is. Actually I think do know what it is, but it's amazing the senders assumed I am fluent in the corporate techno-babble that referenced CRM multiple times like it's a household word that is only used as an acronym and never spelled out. According to Wikipedia, CRM stands for customer relationship management, and "is a widely-implemented strategy for managing a company’s interactions with customers, clients and sales prospects." So this makes me wonder, why wouldn't you just spell out "customer relationship management"? Especially if you're touting your expertise at managing interactions with customers. Acronyms are a good shortcut that makes some phrases easier to say, or type. But that puts more burden on the reader -- who may or may not know the acronym -- and may have to keep stopping herself to remember what it means, especially when it's part of a corporate techno-babble (CTB) message. They don't add clarity. 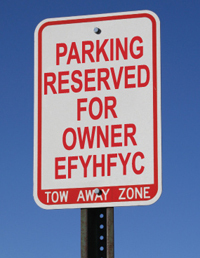 Acronyms make me think of the small business owner who insists on parking his car in a reserved spot in front of his shop at the expense of his customers convenience. They don't make it easy. Copyright 2011, Bremmer & Goris Communications, Inc.